Sachin Tendulkar did it again! Sachin almost top all the records now. 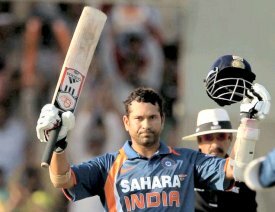 He made 200 runs in 146 balls with 25 fours and three sixes and guided India to 401 for three in 50 overs against South Africa. South Africa was bowled out for 248 runs in 42.5 overs as A.B. de Villiers remained unbeaten on 114. South Africa, who holds the world record of the highest ODI chase, started in a poor way as they lost Herschelle Gibbs (7) in the third over and there on kept on losing wickets at regular intervals. Sreesanth bagged three wickets while Ashish Nehra, Ravindra Jadeja and Yusuf Pathan got two wickets each. 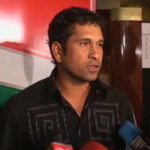 Man of the Match was certainly Sachin Tendulkar. India and South Africa will play the third and now inconsequential ODI in Ahmedabad Saturday. Tendulkar and Dhoni Batting, Tendulkar just one short of his double century had two overs to reach the milestone when suddenly Dhoni started taking apart Dale Steyn. As balls disappeared into distant corners of the Captain Roop Singh stadium, the whole nation for the first time perhaps in history, didn’t want any big hits from the Indian skipper’s bat. Dhoni made his fifty in just 29 balls. But India had never been less appreciative. They wanted history to be made. To make matters worse, Dhoni took a single off the last ball. Six balls to go. Dhoni on strike. Tendulkar still on 199. Charl Langeveldt runs in and the whole nation chants for a single. But Dhoni smashes it for a huge six. Never has there been such a subdued response in India. Another sureshot boundary but a diving Hashim Amla stops the ball and Tendulkar shouts a loud – NO – to a second run. The whole stadium erupts. After a dot ball, Dhoni taps it past point and that was it. History. The greatest becomes greater! “Dhoni taps it past point and that was it.” did you mean Sachin?